If you thought eating soggy fries and cold pizza was unappetizing, then you are in for a shock when you read about this super-fresh (and sometimes so fresh that they’re actually alive) dishes that our fellow human beings relish in different parts of the Far East. 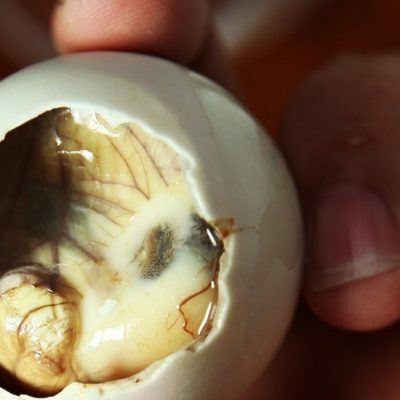 Though it is important to respect foreign cultures and not judge, we can’t help but judge and feel extremely squeamish when we come across these disgusting delicacies people eat in the Far East. Be warned. There are those who are against abortions, because the entire process is considered painful. But there are stories and images that have emerged of the Chinese who feast on human foetuses for health and sexual improvement. The dish isn’t easy to come by (obviously), and the preparation for it is just as painstaking. The unborn infant is stewed for hours on end in special herbal formulations along with chicken and voila! You got yourself some baby soup. Yes, yes, look away. We aren’t referring to the psychological term of a wandering mind. This is an actual delicacy that involves the eating of the brain of the monkey while it is still alive. Quickly, here’s the process before we ourselves wretch up our lunch – tie monkey to table – knock monkey’s head till skull cracks open – pull out live brain – savor the feast while the little primate screams in anguish for a quick death. We’re sorry. Recently a video surfaced of what looked like a live frog’s head and the body being chopped up and eaten right then and there. The same goes for this Taiwanese specialty, where the fish is pulled out of water and made to swim in boiling oil. It is then placed on a plate for serving, while the fish is slowly being cooked to death. Bet you won’t be eating anything close to something fishy for a while, right?! This dish has, in fact, reached all the way to the Land O’ The Free – North America. It’s inhumane to say the least (but after what you just read, your tastebuds might be numb anyways). A half-growing baby duck is consumed from the shell. When you crack the duck egg, what you find is partial egg – partial duck beak and body. It is an infamous aphrodisiac and customers are actually in awe of how the egg is fit for consumption at just the right time. Disgusting. Sushi is relished all over the world. Fresh raw fish and pungent dips are part of the Japanese thoroughfare. There is also the beloved little pufferfish, similar to the one we saw in Finding Nemo. However, it is terribly toxic, with an almost instant death if consumed incorrectly. There is only a small part of the fish that is safe for human consumption. Only super trained chefs and highly scrutinized restaurants with permits can serve this deadly sushi. Eat at your own risk. Anthony Bordain tried this dish and nearly gave up before he even started. Live cobras are grabbed from their cages and their hearts are literally cut out in front of the customer. Still beating, still alive, still gasping – the cobra heart is to be immediately swallowed, straight down the throat, beating all the way down to the stomach. You may then consume a strong bit of alcohol to forget the terrible experience altogether. This is plain torture and whoever came up with this dish should have their feet bound with a rock and sent to the bottom of the ocean to die, much like the creatures they torture for their pleasure. As the name suggests, shark fin soup, probably one of the most expensive and famous delicacies to come out of the Far East, is made by cutting the fin of a shark and serving it in soup form. The rest of the shark is then sent back to the ocean, to sink to a slow, helpless death. Fish and sperm are generally known to be salty, so we’ve heard. And combining the two is apparently a savored dish as well. Cod sperm is either served raw and fresh or stewed or fried, much like sweetbreads. Maybe if you didn’t know what you were putting in your mouth, it would be alright. But if you did, would you actually swallow it?! Did you make it to the end of this article without puking? Good for you! Don’t forget to SHARE THIS ARTICLE!